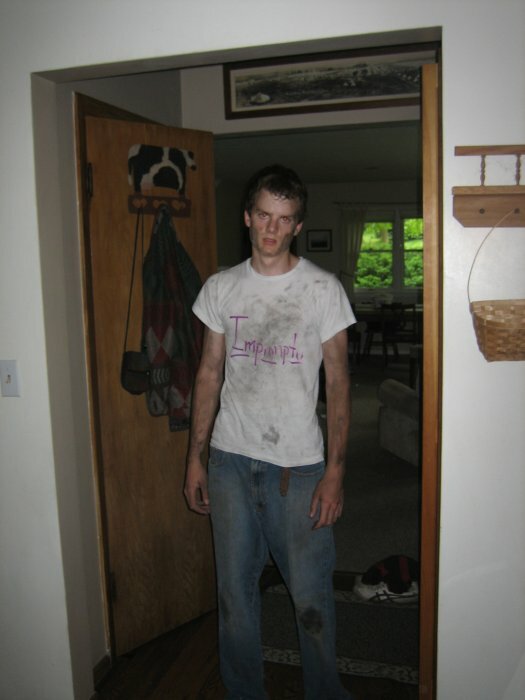 In any reality television show there is one individual who is overcoming some type of hardship. I don’t mean to trivialize the realities, but entertainment has desensitized the gravitas of those trials: someone’s parent was just (coincidentally) diagnosed with a terminal cancer, someone’s parent just (coincidentally) passed away, someone just became homeless, someone just (coincidentally) found their long lost sibling or parent. Like I said, I don’t want to trivialize those realities. They happen. They’re real. It’s reality tv. I think I just hate the tv part. I was watching So You Think You Can Dance one evening, and one of the contestants told his story. He was kicked out of his house at 15 years old, started hustling on the street, and then involved himself in dancing when one of his relatives gave him the chance. His audition was so entertaining. He’s a bboy and was killing the stage with his energy. But, of course, my mind started to wander elsewhere. We love to hear these rags-to-riches stories, overcoming the hard knock life. The Bible, in some fashion, is a modulation of that schema. It’s a story tucked away in the human archetype. However, I want to question our affinity for those stories. We take an interesting pride in those stories, especially as a nation. America is the land where you can achieve that greatness no matter where you come from. But why do people have to start that way in the first place? Maybe we don’t celebrate the actual rags-to-riches story as much as we celebrate the character it demonstrates. Maybe we celebrate the demonstration of overcoming adversity. In that case, I am in full concurrence. I admire people that can overcome adversity. I do not admire, however, celebrating that story as something a country will allow you. Overcoming the odds is not something America can do; it is something that individuals do. America is proud that these persons overcame the odds, but I think we should question whether America is placing them in those odds in the first place. 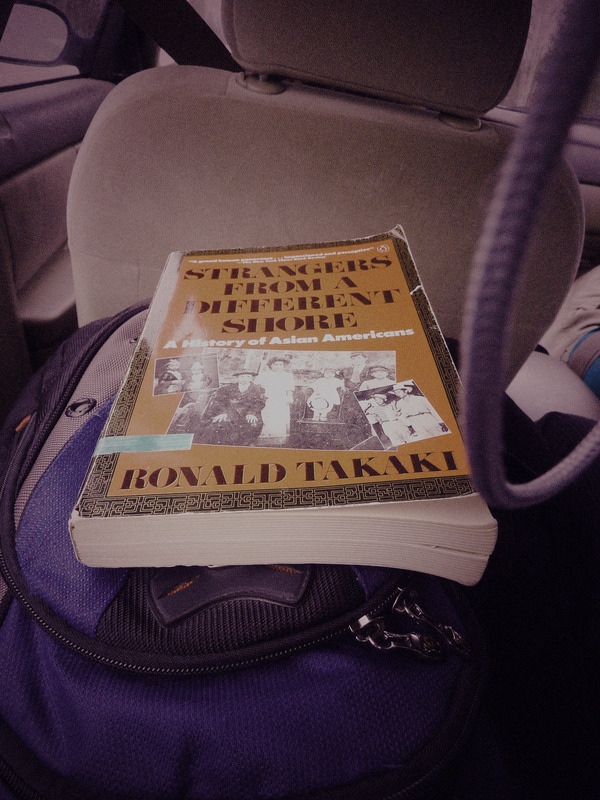 I started reading Takaki’s book at the recommendation of my American Literature professor. We had just finished reading poems from Angel Island. They were poems written by the early Chinese immigrants. In short, the poems were the result of a crude American attitude toward the Chinese immigrants. For as much as I dislike poetry, I took a strong interest in the Chinese poems. I eventually wrote my midterm paper on the poems, analyzing the extent to which the poems foretell and/or capture the Asian American history. I approached my professor for advice on how to continue further readings in Asian American literature. She perked up and started listing off all these authors and books. I was surprised — mostly because I didn’t know that such a wealth of literature existed for my demographic. Of the books she suggested, Strangers from a Different Shore appealed to me the most since it was the most historical (i.e. it wasn’t a fiction). I’m about 200 pages in, and it’s exactly what I wanted to read. It locates Asian Americans in the short history of America, providing me with the fundamentals of Asian America. So far, I’ve read about the American call for (Asian) labor and the Asian response to that call, the Chinese in 19th century America, Hawaii and its plantation laborers (eerily evocative of slavery), the Japanese settlement in America, and I am in the midst of reading about urban Chinese-America. At this point, a lot of what I’ve read isn’t all that shocking. By that, I mean that it doesn’t seem like Asian Americans experienced any unique struggles that any other immigrant population may have experienced. That, of course, is a very general statement. A lot of (wrong) things have happened to Asian Americans since their migration into America, but I guess I’m surprised because I thought those struggles would be more “special” or unique to Asian Americans. Maybe they are and I’m too simple minded. I’ve only recently become interested in Asian American history and legacy. Reason for this is mostly in my personal attempt to recover and preserve my Laotian heritage. I was disconnected from my ethnic roots for most of my life, and I realized this year how awful that is. You can’t ignore who you are or your past because that would be disrespectful and stupid. I’m very interested in becoming a leader of sorts in the Laotian American community. I’d like to preserve our literature, language, and foods among other cultural artifacts and characteristics. My fear is that being Lao will die once the older generation of Laotian Americans pass away, since they have the historical experience; they possess the Laotian American legacy and stories. This next generation needs to receive that. I’m really glad and proud to be Asian American. It puts me in an ambiguous role, but I have a slight inclination that Asian Americans are about to bust. I don’t know why I wrote this. I know that the picture doesn’t look like a bunch of carrots, but it is. 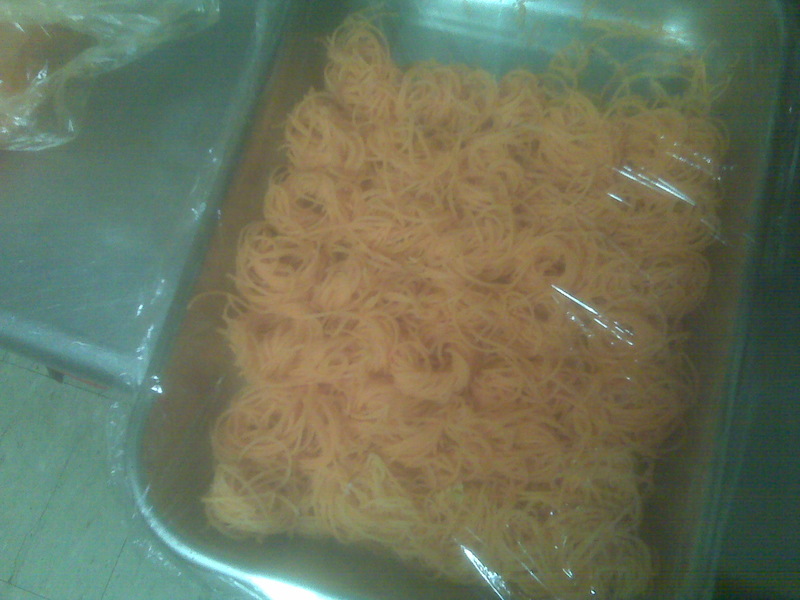 Whenever I work a shift at the restaurant, I have to curl up carrots that we use for garnish on our dishes. One day, a nice family came in. With them was their daughter. She took a strong interest in the carrots. Her first remark concerned the qualities of the carrots, namely that they were curly. I wanted to say something cute like, “Well, little girl, we actually have a bunch of (at this point I considered calling the elves Asian to keep in character of being a Thai restaurant) elves in the back that work all day and all night to curl those carrots,” but then I was caught in a moral dilemma. What I wanted to say wasn’t cute — it was immoral. It sounded like we discriminated against (Asian) elves and sent them to work for us! Mentally distressed, I politely smiled at the little girl and looked to my stepmom to answer. It wasn’t a cute answer, but it wasn’t immoral either. It’s funny how things change when you get older. Today I began to write a paper assignment in the library. I saw a nice lady looking for a computer. At my library, there are computer stations. At some stations there is seating for two. The nice lady went to a partner computer station, but someone else was already sitting there. It looked awkward, so I looked. I wondered how they could be working next to each other because they didn’t know each other. Then the original person’s friends came over to say hi. Then more friends came. Eventually the nice lady left the partner station. I think its admirable that people want to break societal boundaries and norms, but it’s really stupid. You just don’t get close to strangers. 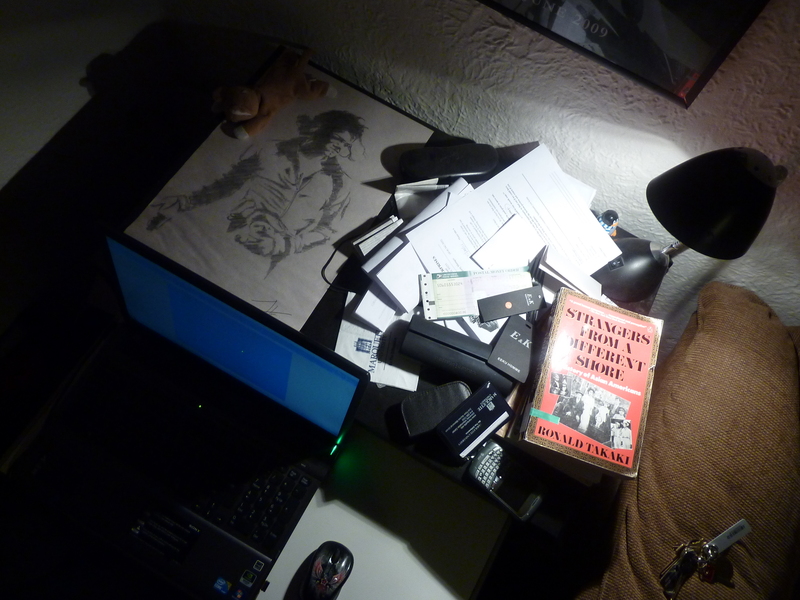 Pictured is my cluttered desk which seats ONE person. I cannot figure out how to fix the bloody captions in WordPress so I just have the image without a caption. I think zoos are an awful place. But they are so fun to go to. I don’t think zoos will be going away for a long time. What are some things that we like but know are bad? The next time you are facing a moral dilemma, think of zoos. When I read on Twitter that Obama would soon address the entire United States, my heart raced. Here was coming an announcement that demanded America’s attention. Here was coming an announcement that would interrupt our Sunday nights. I watched President Obama’s speech. I listened to it. Me and many other Americans listened to these carefully crafted words. These were words that demanded caution. These were words that demanded that America recognize that this is not an American victory, neither American nor a victory. These words demanded that America be humble. The crowd in front of the White House, the NYFD firefighter on the phone — these persons were not those words. “God bless the USA,” “#winning”, “USA!” All idiotic cries of patriotism. Yes, it is fantastic. Another mad man is gone. Retribution flows for those who lost friends and loved ones. Yes, it is fantastic. Celebrate. Celebrate and usher in the further demise of America. Celebrate and nurture more fodder for the rest of the world to feed on. Celebrate and await your death. Sadistic. It sickens me that you are comforted by a man’s death. It sickens me that it makes you feel better. Osama bin Laden has been killed by the Americans. What else will America kill? “It is mine to avenge; I will repay.” ((Deuteronomy 32:35)) America, Americans, you are not God. Normally I would refrain from sharing my thoughts on something as sensitive as this. You might call me un-American. You might think I was happier when bin Laden was alive. But I swear to you, it’s not like that. I’m happy to be an American, though perhaps not proud. I’m glad that a symbol of terrorism and cruelty has been rid of. But I am not glad with how we are responding. The American response to the death of Osama bin Laden, no matter how cruel he was, disgusts me. I do not understand how so many can look to this event as a patriotic event. How can you ask for God’s blessing in this context? How can you associate this with our national anthem? This is an historic moment. Not because bin Laden died. But because this moment will dictate the future of America. May 1st, 2011 will be the mark of American morality and morals until her dissipation. Or is this the beginning of our end? That people are quick to see this as an American accomplishment and overlook its questionable ethics identifies the American mind and moral. I am discouraged and ashamed.